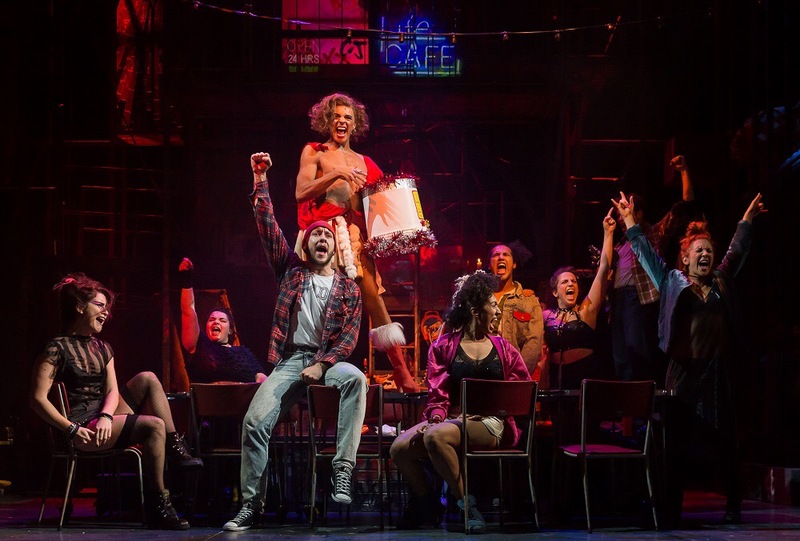 So good we reviewed it twice: We promised you two reviews of Rent the musical at Theatr Clwyd, and who are we to let you down folks. This is unheard of here at We Are Chester Towers, but our two writers were so taken with this musical that they have both written reviews and so we thought we’d share both of them with you. Here goes with the thoughts of our second reviewer, James Wright. Huge thanks to Sophie and James for their contributions. Photo by Brian Roberts. A story of love, loss, friendship and acceptance amongst a group of social outcasts: Welcome to Rent the musical. “The City of Neon and Chrome” is surely a wonderful thing, especially on Christmas Eve. The days and lives of our protagonists, including Roger Davis, long-time tortured soul and HIV-positive, and his flatmate, Mark Cohen, would-be filmmaker just waiting to break it big, are on display for all of their contemporaries to enjoy and empathise with. The AIDs epidemic sweeps its way through an otherwise happy-go-lucky ragtag group of outcasts, who soldier on through their lives. Sounds like a pretty strange and actually quite depressing place to live, right? Thankfully, it’s merely the basic narrative of Rent the musical, celebrating its 20th anniversary this year. And where better to celebrate a performance of sheer brilliance, with all the grungy aesthetics of the ’90s and the apathetic free-love of a Bohemian New York, than in Theatr Clwyd in Mold. Yes, the guys and girls of the Robert Mackintosh and Idili Theatricals Limited group have made one hell of a show here. Celebrating the 20th anniversary of Jonathan Larson’s Pulitzer Prize and Tony Award-winning musical, the cast and crew are taking this show on the road as they head to the West End for the Christmas season as well as a major UK tour. And just think, we get the privilege of seeing such a performance in a little market town like Mold. Lucky, thy name is James. Described as being a “rock opera” – and trust me, as a major fan of rock music, it is a thing of absolute beauty – Rent ran initially on Broadway for an impressive 12 years, starting way back in 1996, and even got the big screen treatment when it was adapted into a movie in 2005. I may need to track that one down for my collection. Jonathan Larson has created a world inhabited by a group of Bohemian artists of varying talents, who struggle to maintain their friendships as well as their blissful, non-conformist ideals in the shadow of New York City’s East Village. Along the journey, a narrative set across the space of a year, they face their problems head on, making personal self-discoveries and finding out what really matters most in life. A tear-jerker, especially within the second half, Rent takes the key idea that Moulin Rouge established – you know what I mean, the greatest thing you’ll ever learn is just to love and yadda yadda yadda – and makes it feel as heartfelt and meaningful as ever. I don’t want to spoil too much of the narrative just in case you are a Rent virgin, as I was until recently, but one central character is a literal personification of this now clichéd message for their friends. It’s really tough not being able to say too much for fear of spoiling things for you, and I’m actually having a bit of trouble reigning myself in. Set in one of the best-looking stages I have ever seen, the music and action take you from the flat of Roger and Mark to the street below their apartment, to the park (I imagine it’s Central Park they are referring to), to a café which the Bohemians frequent. It all takes place on what can be best described as dressed-up scaffolding. But the stage is used to its full advantage and the multi-levelled benefit is a thing of magic, which is handy when the vast majority of the plot takes place on Christmas Eve. At times, it almost feels more like a weird work of art than a set design, though that could be the graffiti, neon, and stain-glassed window that makes me feel this way. Now, I must admit, I’ve never been the biggest fan of musicals, often woefully dreading the inevitable next break into song – STOP SINGING AND GET ON WITH THE NARRATIVE! – but there are a few exceptions to this rule, and Rent is the latest one to fit into that particularly niché corner of my interests. The singing, oh my God, the singing. It was like a group of angels were sent to us. Ryan O’Gorman, who plays part-time philosopher, full-time romantic Tom Collins took. My. Breath. Away. It was like the sultry deep tones of Bruce Springsteen coupled with the goosebump-inducing voice of Pavarotti all rolled into one. And then there was the acrobatics on display courtesy of Layton Williams, who plays Angel Schunard, a drag queen percussionist who I may have alluded to earlier in this review. We’ll just take a moment whilst eagle-eyed readers and those in the know go back to find the part I’m referring to. You with us? Welcome back. I cannot stress enough how good this musical is. Do you enjoy the idea of some of the best acting skills on display in a local venue such as Theatr Clwyd? Do you enjoy a good, hard-hitting, toe-tapping, head-bopping, soul-moving score regardless of context? Did you like Moulin Rouge or have you seen Rent before? Do you have a heart? If the answer to any of these questions is yes then that is reason enough to go. But be quick because it’s only going to be in Theatr Clwyd until 12th November. I know, I’ve not left much time for you all to go before it leaves us, stretching its wings, and flying the proverbial nest like a strange music-spewing, grungy, Bohemian bird, but I urge you, please please please find time to give yourselves the gift of Rent. Tickets, I am reliably told, can be picked up for as little as £10. I just wish I could watch it every day. I wonder how long it would take for the delivery man to bring a copy of the movie to my door? I found this piece interesting yet persuasive, I applaud ‘Angela Ferguson’ as she is a personal aspiration I aspire to be like one day, I enjoy reading these professional pieces of writing and that just welcomes me in more because I like the style of writing, the way in which it invites you in and lets you fantasize about what could be. Angela Ferguson is an inspiration to me in more ways than one. A terrific piece.